A long time ago, in a galaxy far, far away, I was a marketer in the engineering consulting business. Not as exciting as Star Wars but it did sometimes seem like I was on another planet. Kidding aside, one of our most successful tactics for generating leads was hosting seminars. We’d work with our technical staff to identify topics that our prospects were interested in learning about or HAD to learn about because of changes in regulations. Each event was held in one of our offices or at an off-site meeting place. The agenda usually included multiple speakers all presenting something relevant to the overall topic. These events were successful because we were able to invite very specific prospects and clients to learn about something that was causing them pain or was about to cause them pain. We were then able to deliver our teaching point-of-view on the topic in person and really establish ourselves as the experts. Our prospects looked forward to attending these seminars and prioritized them in their schedules. So while these events were successful, they were also a pretty big line item on our budgets. We designed, printed and mailed invites. There was always some kind of food involved. If we held it off-site, there were rental fees to consider. We also created summary materials and purchased some “swag” to give away. In addition to the budget, there were always people we really wanted to attend who couldn’t because the distance was too great. Remember, this took place a long time ago…a time when there was no such thing as GoToWebinar or Webinato or even video conferencing. We often talked about how these events could be even more successful if we could offer a way to attend without having to leave your office. Now, I am not discounting in any way the value of the face-to-face time these events gave us with our prospects and clients. Part of the reason for the success was the access to live people who were experts in the topic our audience was anxious to learn about. However, it would have been great if we could have expanded our reach through technology and offered a similar experience to more people. And then to have it as a recorded piece of content to share even further…needless to say, webinars would have been a go to content type for us. The impact webinars can have on lead generation stretches beyond just consulting businesses…any industry can use them to reach their buyer personas in a more personal way without breaking the bank. Here are 6 reasons you should consider hosting a webinar. Webinars provide an opportunity, unlike other content types, to develop your authority and your teaching point of view on topics that matter most to your prospects. While blog posts and whitepapers provide a similar opportunity, webinars allow you to dig deeper into the topic and share more information in an easy to digest format. You can cover a lot more in a 45-minute webinar than you can in a 1200-word blog post. Looking for content ideas? Chances are your webinar will cover multiple points related to the topic. Build on those to create blog posts. It is also a great source of information for a whitepaper or ebook. You may even be able to create a checklist or infographic based on the information shared in the webinar. Increase your ROI on the webinar by turning it into a content source. Truly understanding the challenges faced by your buyer personas is key to any successful demand generation process. What better way to make sure you do understand than by allowing them to ask questions during your webinar? This allows you to hear first hand, directly from them what is keeping them up at night. It also allows you to make a personal connection with the attendees that will have a lasting impact. What other content type does that? People are busy. Not everyone will be available to attend your live event but that’s ok…you can record the webinar and make it available to everyone who registers. Once it is recorded, you can use it as a premium content offer or as part of a lead nurturing program. It can also be used to support the efforts of your sales development team. The impact your webinar can have goes on long after the actual date. As I mentioned earlier, in person events can produce great results but they can also be very expensive. Hosting a webinar is a great, inexpensive alternative. Typically invitations are sent electronically. There are no costs associated with food, the venue or travel. All it takes is a broadband connection, a microphone and webcam to get started. Perhaps the most important reason to host a webinar is to generate leads. Chances are if someone signs up and is willing to take time out of their schedules to participate, they are very interested in the topic. As people register for the event, you are able to collect information about them. Classify them as you would any other leads. Be sure to take advantage of the opportunity to follow up with the attendees after the event. In addition to sending a link to the recording, offer them related content and add them to the appropriate nurture program. 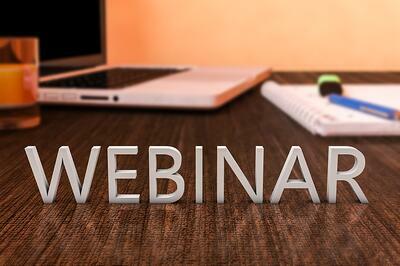 Webinars provide an excellent opportunity for you. It is worth adding them to your content mix to find out what kind of results they can drive for you.